I am going to share with you How to Create a Free Blog with Blogger.com. 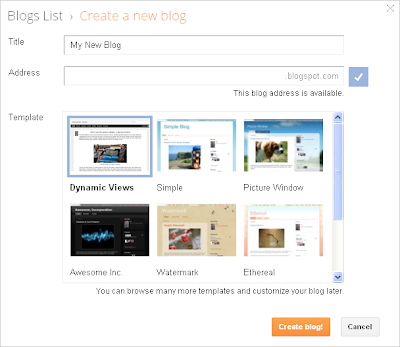 Blogger is a free service for blogging by google so you can easily make your free blog there. A lot of websites are available on the web that provide free services to create a blog but blogger is the best one. Google Adsense is also a free source of earning and you can make money with the combination of bothe Blogger and Google Adsense.Blogger gives you a free blog and Google Adsense gives you the facility to make mony with your blog.To create a free blog with blogger just follow these simple steps. To create a free blogger blog, you need to have a Google account. If you haven't got a Google account, create a new Google account. Now you will have to go through Blogger sign up wizard.Enter your Display name which will be used to sign your blog posts and accept Blogger's Terms of Service. Blogger will Redirect You on Blogger Dashboard Now Click On New Blog Button. Now Fill up Create a new blog Box. Enter your preferred blog title and select preferred blog address followed by blogspot.com. Note: If your entered blog address is not available, it has taken by someone already. Then you will prompt to enter another one. You are eligible to have only available blog address. Now Select Your Favorite Template from Given Template List and Click on Create blog Button. Your New Blog Title Will Appear on Your Dashboard.Click on Your Blog Title and Start Blogging.